In recent years, 8 to 25 reports of Lyme disease meeting case definition are received annually. Almost all Washington cases are the result of tick exposure out of state; endemic Lyme disease is not common, with generally only 0 to 3 cases per year. The risk of infection in-state is low throughout the state. Between 1/2005 and 12/2016, only 13 confirmed Lyme cases with in-state exposure were documented. Where are Lyme-carrying ticks found? The vectors of Lyme disease are certain Ixodes species of ticks. 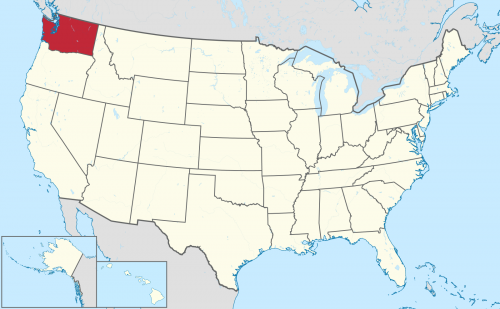 In Washington State and the rest of the western U.S. coast, I. pacificus is the only recognized vector. Tick collection studies in Washington during the late 1990s and from 2010-2016 have found I. pacificus primarily west of the Cascade Mountains, but some have been found in the central counties on the eastern slopes of the Cascades. In 6 years of tick surveillance, only 19 of 1147 (1.7%) of I. pacificus tested in Washington were found to be positive for B. burgdorferi. These positive ticks were collected from Clallam, Mason, Yakima, and Klickitat counties. Tick collection has not yet occurred in all counties in Washington. Because “chronic Lyme” is caused by beliefs socially transmitted by humans, Washington has many advocates for the unrecognized diagnosis. As of April 2018, there are at least 20 quacks in Washington who diagnose and/or treat chronic Lyme disease, many of whom have been associated with the rogue organization ILADS. While the “Lyme literate” practitioners in Washington include MDs, most of these quacks are naturopaths, who are themselves fake doctors, so it makes (disturbing) sense that they would be diagnosing and treating fake diseases. 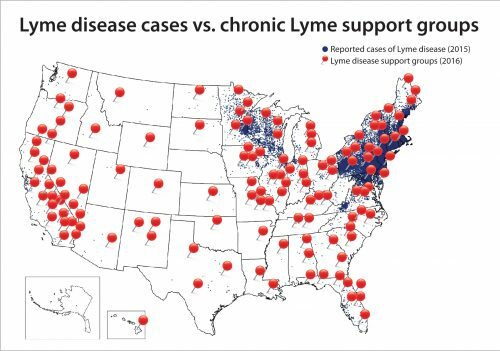 None of the “Lyme literate” practitioners in Washington appear to have any recognized advanced training or certifications in infectious diseases. One popular Washington quack, Dietrich Klinghardt, is discussed in an entertaining manner in the article ‘RHOBH’ Star Yolanda Foster’s Quack Doctor EXPOSED For Shady Lyme Disease Treatments. In 2013, a propaganda group called LymeDisease.org surveyed people claiming to have chronic Lyme disease (CLD). They narrowed their sample to 3090 individuals who met a set of criteria and published the data in PeerJ. 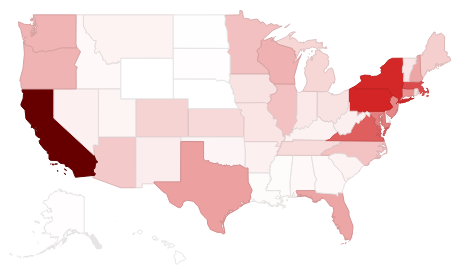 Since CDC has statistics about confirmed Lyme cases for 49 states and DC (Hawaii isn’t included), LymeScience extracted the state residency data about the 2,794 CLD people surveyed who said they were in those 50 jurisdictions. 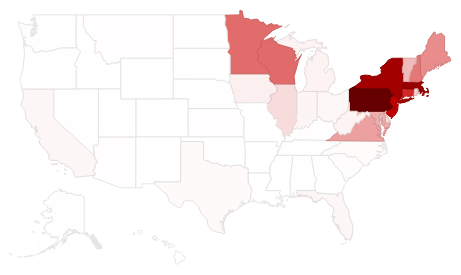 Of the 27,203 CDC confirmed Lyme cases in 2013, only 11 (0.04%) were reported from Washington. But of the 2,794 CLD people surveyed, 72 (2.58%) were reported from Washington. So CLD people surveyed in Washington were 63.73 times (2.58%/0.04%) more common as a percentage of the total than CDC confirmed Lyme cases. Of course, because of the small numbers involved, these numbers may have a large margin of error, but there is still a substantial over-representation of Washington residents in the data. A substantial CLD over-representation can be observed in several states, such as California, Texas, Florida, and Oregon, while there seems quite the under-representation in areas that usually have high incidence of real Lyme disease, such as Pennsylvania, Massachusetts, New Jersey, New York, Connecticut, Minnesota, Wisconsin, and Maine. This is a preliminary analysis, so keep checking back for updates! Screenshot taken April 2018 of Facebook pages. 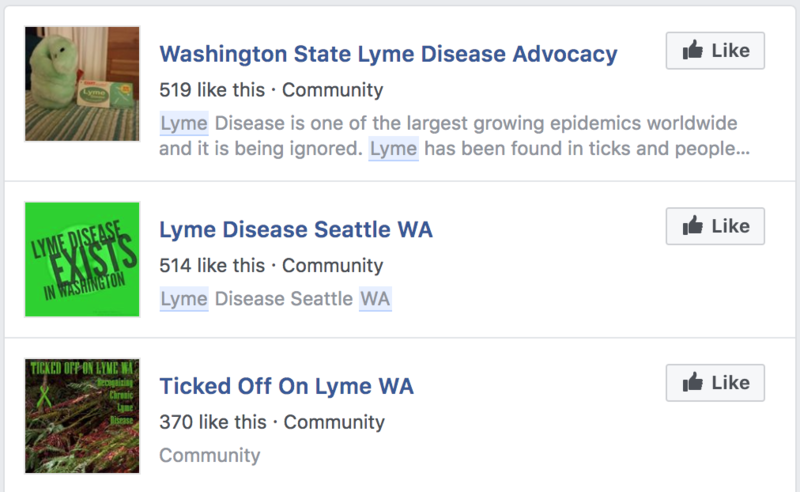 A related Facebook group with 600 members (“Seattle/Washington State Lyme Support Group”) is not shown. A. The most common treatment for a patient with acute Lyme disease is a 14-day course of doxycycline, an antibiotic. B. Patients treated with long-term antibiotic therapy for Lyme disease have had severe adverse responses, including death. Other reactions include bloodstream infections, pulmonary embolism, septic thrombophlebitis, and gastrointestinal bleeding. C. Long-term antibiotic therapy has not proven to provide any long-term benefits to patients with post-treatment Lyme disease syndrome. Benefits appear to last only as long as the treatment continues. When treatment concludes, symptoms return, indicating an underlying, undiagnosed cause of symptoms. D. Clinical trials show no benefit to long-term therapy in comparison to the initial 14-day treatment plan for acute Lyme disease. Long-term antibiotic treatment of “chronic Lyme disease” – a term the medical community doesn’t find meaningful – is not in patients’ best interest. Most patients with medically unexplained symptoms who received a diagnosis of post-treatment Lyme disease will require more than antibiotics to manage their symptoms. These patients should consult with their physician regarding a treatment plan that also includes emotional support, nutritional guidance and physical therapy. Practitioners should openly address any concerns and should reassure patients. Antibiotics are no substitute for sympathetic listening and explanation. E. The benefits associated with long-term antibiotic treatments do not outweigh the risks to the residents of Washington. Evidence-based science has not determined the best long-term treatment option for post-treatment Lyme disease syndrome. Evidence-based treatments should remain the standard in Washington to ensure our residents’ safety. The Medical Commission strongly recommends not adding standard of care and related language to statute because of the evolving nature of science and medicine. Effective treatments must be free from statutory constraint if Washington practitioners are to deliver evidence-based, high-quality care to the state’s citizens. Physicians and Physician assistants should not fear disciplinary action from the Commission for ordering, prescribing, dispensing or administering treatments, for a legitimate medical purpose and in the course of professional practice. The Medical Commission has no evidence of disciplinary actions taken against practitioners for either diagnosing or treating Lyme disease.